Pixel Soccer is a game currently in development at Super Rock Games, an indie studio in London. It is speaking directly to my interests. Chief among those being football and the classic Sensible Soccer series. Pixel Soccer is basically an attempt at remaking that vintage "arcade" approach to the sport, only instead of using tiny little block men, it's using awesome pixel art. That art isn't just useful in terms of throwback appeal, though. It's also letting Super Rock get away with "impersonating" the faces and kits of real players and real teams, without (presumably) actually replicating them closely enough to trigger a legal stoush. I mean, that's the Premier League below, but with blurry crests and sponsors is it really? Just look at those recreations up top! 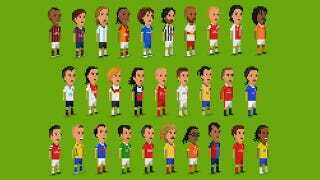 I can't stop laughing at pixel Özil. Super Rock are hoping to have the game out later this year, complete with player and team editors. They're also trying to have a World Cup edition out in time for the big kick-off in a few months' time. Pixel Soccer will be going live on Kickstarter soon. You can check out more pics (and caricatures) on the game's dev blog.